In a 26-year career with Emirates, Boutros Boutros has played a key role in building the company’s global brand, with a broad remits that includes all marketing and communications activities—advertising, sponsorships, events, promotions, merchandising, public relations, internal communications, internet communications, and passenger communications—across the globe for the 40-plus businesses under the Emirates group umbrella. Overseeing a team of more than 150 professionals and more than 100 global agencies, he is one of the most influential and high-profile corporate communicators in the Middle East. Boutros joined Emirates in 1991 as media relations manager for the Middle East, but his responsibilities soon expanded to include Europe and North America, and in 1996 he was made manager group media relations, overseeing all aspects of PR for Emirates Airline and later senior vice president, media relations, sponsorships and events. He was promoted to his current position in 2009. 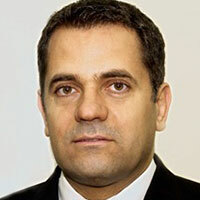 Boutros has over two decades of experience in journalism, public relations and marketing. Prior to joining Emirates, he was the London-based business editor of leading pan-Arab daily newspaper Sawt Al Kuwait, and was managing editor for Al Hawadeth.